So this megaphone playing out again is just plain crazy. Three weeks later--ding-ding, we have a winner! The SPX has touched the top line of the megaphone drawn back in mid-October. Now here's another crazy idea: the megaphone pattern continues to play out, and the SPX reverses here and crashes 200 points down to the 1,800 level. I marked up this chart last weekend (chart is dated 10-31-14). At this moment, this megaphone projection looks as crazy as the projection for a massive rally back to 2,030 did in mid-October. 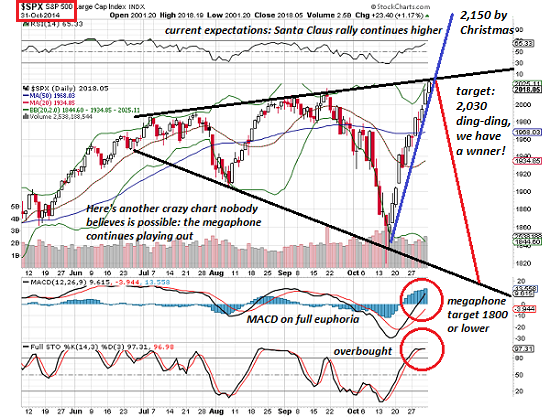 Right now, many pundits are projecting SPX 2,150 by Christmas as a done deal. Heck, why not say 2,300? Just extend the rally line a few more weeks. The euphoria is palpable: sentiment is pegged to the top of the charts, expectations of central bank easing are pegged to the top of the charts, profit expectations are pegged to the top of the charts, complacency is pegged to the top of the charts, the expectations of further declines in the yen are pegged to the top of the charts, and so on. There is literally nothing standing in the Bulls' path at this point--everything is going the Bulls' way.Just like it was going all the Bears' way in mid-October. That spot of bother is now being written off as Ebola-inspired nonsense, never to be repeated. Perhaps. But there is still a substantial list of things that could disrupt profits, capital flows, volatility, sentiment and central bank omnipotence. Back on October 13, I discussed the notion that the Fed (and its central bank cronies) would not let the stock market crash before an election: Will the Fed Let the Stock Market Crash Before an Election? Voila. That script played out rather well. Yes, the Bank of Japan had to step in and do the heavy lifting, and Mario Draghi had to repeat his now-tiresome stand-up routine of the ECB will do whatever it takes to blah, blah, blah, save central banking from itself, restore the imploding remnants of European Imperial glory, or whatever. But the idea that central banks coordinate their stick-saves and we're gonna-save-the-world-yet-again media spew is not exactly new. So this megaphone playing out again is just plain crazy. 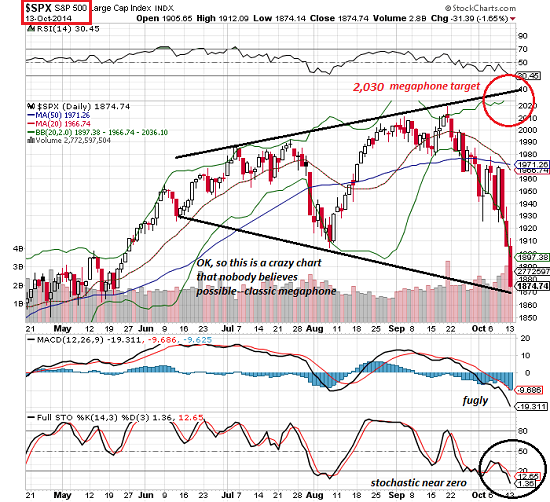 No way can the market retrace its well-deserved rocket-launch to 2,030 and change. That is impossible. Glad we got that settled: the pundits all agree: don't just buy the dip, buy the new all-time high and everything in between. Note: this stew of conjecture and sarcasm is not a recommendation to do anything but laugh heartily at the insanity of "rational" markets.